• Mr. Trump explained his supporters to those voters who are wary of them and their perceived anti-immigrant views. “These are valid concerns expressed by decent and patriotic citizens,” he said. We do not usually hear him speaking like this – in a sense speaking directly to those who fear him as much as the the audience right in front of him. • Trump ticked through the names of three Americans who were killed by undocumented immigrants. These are staples of his speeches and familiar to his audiences at this stage of the campaign. He has held them up as examples of an immigration system run amok with tragic consequences. 3. Have zero tolerance for undocumented immigrants who have committed a crime. He will deport them. 4. Triple number of deportation officers at the department of Immigration and Customs Enforcement. 6. Stop issuing visas to any country where “adequate screening cannot occur” that might endanger national security;. 8. Complete a biometric entry and exit visa tracking system under development. “It will be on land, it will be on sea, it will be in the air,” he said. 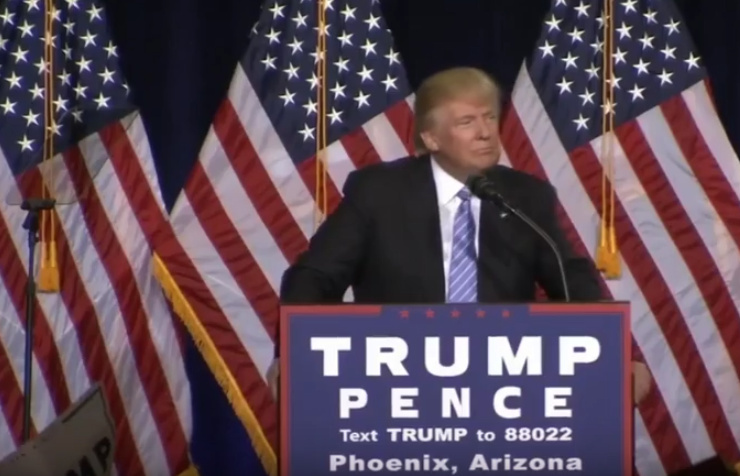 You won’t believe who gave props to Trump after his speech… The New York Times! Yes, it really was that great.